Meet Just Ducky, this adorable stuffed duck from the Cheery Cheeks collection. 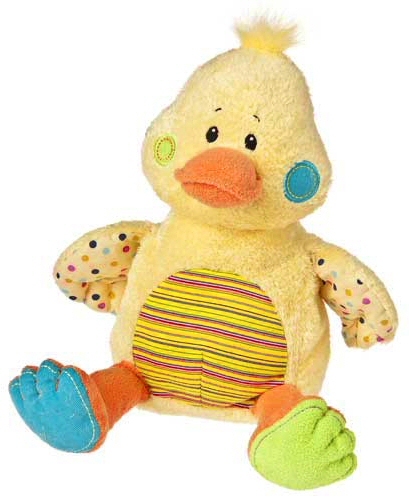 You are just going to love this amazing plush duck with her sweet smile, soft lemon-yellow fur with embroidered eyes and eyebrows, soft orange bill and legs, turquoise corduroy cheek spot and foot, soft green fabric cheek spot and other feet, festive polka-dotted under-wings, and fun yellow and multi-colored striped tummy. She'll make you smile with just a glance and once you pick her up and give her cuddly, understuffed body a hug, this stuffed duck will steal your heart and become a most cherished friend for years to come. This adorable duck fabric wall art is a wonderful addition to any barnyard, farm scene, or other outdoor theme. Our adorable large rubber duck fabric wall art is a wonderful addition to any barnyard, bath scene, or animal theme. Add a splash of charm and whimsy to any room with these adorable Ducks & Bubbles wall decals.